Do you dream in stories? I do. They often seem so real until on awakening I try to recount them. Then they seem implausible and even silly. I suppose that while sleeping my brain is freeing neurons by discharging memories and rearranging them into narratives. A departed friend or a past acquaintance appears in situations in which sometimes I am the main character and other times just an observer. In those situations feelings spring forth, regrets at having not finished something, fears of being unprepared, exhilaration in flying above the world, excitement while acting on a stage, accomplishment in teaching a way to do something, wonderment in facing great opportunities. No wonder that Freud and his followers claimed insight into their patients' psyches through their dreams and that shamans and priests discerned higher powers speaking in dreams. In Hallucinations, neurologist author Oliver Sacks shows that most internally brain generated visions whether stimulated by sensory deprivation, drugs, strokes, parkinson's disease, or epilepsy are contained in stories and can be narrated by the experiencing person though often in concepts that were previously learned and culturally connected. Though interestingly he shows that in the aura of a migraine the brain often produces patterns enough for him to speculate that the brain, like nature and life, has a self-organzing function, makes patterns in chaos including stories from disparate events. Just as a perception can be a hallucination for an individual, might a story be a hallucination for a group? The brain, thanks to the development of the frontal cortex, weaves sense perceptions and their accompanying feelings into stories and thus makes mind. Mind is forever trying to make sense of things through stories. We have learned that thinking is using categories and making analogies, fashioning symbols and constructing models. But they are brought together to appear in stories. All our modes of knowing involve narratives--the forms of art, the formulas of science, the words of ordinary language, the myths and rites of religion. I even hypothesize that the story is the unity of all human knowledge. The story not only makes a mind; it makes a people. Consider the Iliad and Odyssey of ancient Greece with its heroes, gods, city-states, alliances extending to Alexander and the Ptolemaic empire. Consider the twelve tribes that shared their stories and became the Hebrew nation from which came the Jewish Rabbinic, the Christian Roman, and the Arabic Islamic stories and civilizations. Consider the indigenous peoples of the Americas who told origin stories to protect their peoples and their lands. Stories teach what is true and false, right and wrong, real and ideal, godly and demonic. In French "story" and 'history" are the same word histoire. The wars between Protestants and Catholics, between Asians and Europeans, Soviets and Americans, and other civilizations even today are conflicts in stories. To resolve these conflicts we need to know the stories of peoples and nations, appreciate and share them sympathetically, and be willing to create an new more inclusive story. When we really want to know a person and what makes him or her tick, we need to know that person's story. When we build a relationship with that person, we share stories and find what is common in our very diverse stories--a point of convergence that we know is always there. I am my story. My story is mystery until I tell it to myself and to others so I understand its power over me and transcend it. You are your story. When I listen to, really entering into your story, I know and become you. When I share my story so that you can understand it, we make a connection. We are a series of events--in process. Not immutable essences. We are stories that have no ending, still being written, in process. To know each other we must enjoy each others process of becoming--who we are and will be. Through our accounts, our sting of words, gestures, and designs, we recall our past memories; we intend you future ideals; we integrate our present existence, our presence. Only when we learn to do this as persons and as communities will we have a chance of uniting stories and building a history that celebrates our individual uniqueness and our communal mission. Story is the unity of our divergent ways of knowing. Religion is a story and tells stories to give meaning to humans in the world and to teach them to achieve their purpose. Common sense uses stories to teach us how to live in the day-to-day ordinary world. Science critiques and refines the stories of religion, art, and common sense to tell the story that explains the universe, nature and its elements, and life and humanity. Art creates and embellishes the stories that religion, common sense, science, and all our modes of being in the world uses. Which story do we tell? When is a story true or false? Indigenous fables, origin stories, religious myths, heroic tales, prophetic parables, news accounts, historic fiction, science fiction, memoirs, biographies, histories of nations, histories of civilizations, natural philosophy, sacred scriptures, diaries, blogs, books of revelations, case studies, poetic anthologies, anthropological observations, recorded memories, adventure tales, movies and documentaries, fairy tales, romances and novels, crime stories--all are works of art, human creations. Are some true and some false? Some to be taken "literally" and some not? Some good and some bad? The better question might be: how does the story lead us to truth or what is the truth that the story is revealing and/or concealing? Truth and falsity, good and evil, right and wrong are matters of "judgment"and "decision"--the Greek word for which is crisis from which we get the word "criticism," "critique," and "critic." Richard Rorty in demystifying philosophy said that a philosopher is but a literary critic. The way to truth is through criticism, i.e. making a judgment based on evidence that others (e.g. peers) can review. In critiquing our stories, we need to be attentive to the genre, to the intention of the story-teller, to the context and culture in which it was written, to the values of the story-teller, the critic, and others to whom the critic speaks. In addition, the sharpness of style, the vividness of images, the clarity of meaning, the fun of expression, all make for the interest, affection, and education of the reader or listener. Since the Enlightenment and the Scientific Revolution, we use the methods and canons of science to discover and explain the truth in our stories. Joseph Campbell and Mercia Eliade discovered and expressed the truth in myth and in the tales of gods and heroes. Theologians using historical criticism unveil the truth in the gospels and other sacred scriptures. Anthropologists uncovered the truth of indigenous fables and origin stories and the revelations of spirit driven prophets and priests. Art critics enter the images of novelists, film-makers, painters, and fiction writers to reveal the beauty, the beliefs, the existence and future of humanity. Trained historians and biographers search the records to marshall the evidence for the conclusions they reach. The Iliad was a great story expressing truths about human existence and the culture of Greece even before Schliemann discovered Troy. It is not necessary to prove that Noah's Ark and the Great Flood existed to affirm the moral of the story. The story of the Big Bang and Evolution is the latest and best origin story that we have because it is based on evidence that others can review. However, it is not the final story--because our story is still being written. We divide our libraries and book stores into fiction and non-fiction and yet the line between is so fluid and fuzzy. There are political, economic, and historical works in non-fiction which are almost totally made up, self-promoting without peer reviewed solid evidence, and based only on the self-interested opinion of the writer and his tribe. And in the fiction section there are poems and visions written by great thinkers that plumb to the deepest truths of human existence. It is a matter of interpretation and that is what experienced critics, those familiar with the genre, the scope, the history, and the context of the story do. They interpret and pass judgment on the value and truth of the story. And often they disagree. But usually there is a convergence as they learn from one another. The science of interpretation is called "hermeneutics." But hermeneutics is another word for criticism. Since all thinking involves "figures of speech," i.e. analogy including metaphors and similes and since most analogies are contained and take meaning in stories, interpretation is our way to critical thinking. And critical thinking is our way to truth. Next: What is critical thinking? Why is critical thinking important? How is it taught? "There is no substance wihout form; but there is much form without substance." Vishnova. We visited the Andy Warhol Museum in Pitsburgh mostly because we wanted to see the exhibet of Corita Kent that was on display. But after devouring the Corita works, we walked through the life, times, and works of Andy Warhol. Andy Warhol plays with forms without much substance. He has us cast our eye on a society, ours, that is more concerned with form over substance by mirroring it. In contrast Corita Kent also considered a "pop artist" like Warhol shows that, for those who can see, substance is everywhere even in empty forms like commercial ads, ugly structures, and banal propaganda. We frame always. But when we conscientiously frame, we can get beyond the frame that we are using and change it. We become masters of our forms rather than manipulated by them. In politics and religion, in markets and urban streets, in science and ordinary discourse, in all of culture, can we free ourselves of the frames which are being foisted upon us through media, talk shows, pundits, politicians, and preachers who pretend to be telling us the news, the facts, the truth? Both artists help us notice the forms by which we frame so that we can free ourselves of them. Not absolutely. For we are never without form. But transcendently we can choose anew. Both Andy and Corita, one using form to empty himself of bland and course substance, the other using form to fill herself and us with exciting and creative substance, show us a way to free ourselves, to become ourselves, to lift ouurselves thrrough and beyond form to greater and greater substance. Many economists, historians and social critics are questioning whether capitalism, especially its American variety, is in demise. They see us caught in a 19th century utilitarian, social Darwinian pattern of thought and behavior that may have been useful for some who captured earths resources and furthered the Industrial Revolution while wrecking havoc on small farmers and industrial workers. That is until they organized for reforms during the Progressive ages of the two Roosevelts aided by labor unions and progressive leaders of industry. These reforms inducing government regulation and initiative moved large numbers into the middle class during the mid 20th century to enjoy the fruits and technologies of the industrial age as well as its nationalism, colonialism, and wars. Study after study shows that the middle class is now threatened and diminishing within a new Gilded Age of plutocrats. The Right, now solidly organized in the Republic Party, blames government intervention and would roll back the clock to the laissez-faire approach in which government stops trying to distribute wealth and let wealth accrue to the wealthy who will make the economy work for everyone. "Let the Market decide," the Right proclaims. The Left, now solidly organized in the Democratic Party, blames the plutocrats (e.g. "Wall Street") who have bought government officials, lobbied successfully to shrink government regulation of too-big-to-fail financial institutions, to defund "entitlements" and programs for the poor, and to effectively reduce progressive taxes on the rich with the promise that they will trickle down to the deserving poor. "Let Government defend the 99%," the Left proclaims. Both assume the economic system as both Adam Smith and Karl Marx described it and as Milton Friedman and John Maynard Keynes attempted to adapt it to the 20th century. This is a "free market" system of "producers" separate from "consumers" in a "supply and demand" cycle constituted by the millions of individuals furthering their individual "self-interests." This is a system where "capital" consists of material resources owned privately and exclusively that are measured in money and that can be used in making things and providing services that consumers will buy over and above the cost of making or doing them. This accumulates additional capital through "surplus value" or "profits" to owners who can invest in new enterprises thus growing wealth for themselves first and desirably for all. It is the system that government defends by enforcing free trade when it doesn't impede local business, fighting pirates and countries that impede American businesses, ensuring a free market in which competition can thrive, correcting abuses, and mediating conflicts. But that is not the way the system works any more, say many new entrepreneurs and economists. Or at least the way it should when it is clear that it is causing record climate change, disparity in wealth, high levels of imprisonment, push-back terrorism, and political dysfunction. There are thousands of experiments in what economists are calling "new economy," "beyond capitalism," "social capitalism," and more. To identify and catalogue many of these experiments and the new emerging economic theory to explain them, I recommend consulting with the Next System Project being organized by Gar Alperovitz, Gus Speth, Joe Guinan, and hundreds of other activists and intellectuals. This is the opening of a conversation that calls for a rethinking of the total political economy, its assumptions, its values, its policies, and the narrative that gives it meaning. Jeremy Rifkin, The Zero Marginal Cost Society, attempts to do just that. He traces the development of the two Industrial Revolutions of the 19th and 20th centuries into the third that is coming to fruition in the 21st. He shows how the Internet of Things, which began with the Internet of Communication, is now pursuing the Internet of Energy and soon the Internet of Logistics, has reduced marginal costs of production almost to zero, has promoted more emphasis on access to things than ownership of them, and is reducing the distinction between producer and consumer. He sees that the Market theory of economics supported by 19th century utilitarian ethics, Calvinist Protestantism of divine favor by wealth, and the failure of feudalism and mercantilism led to personal property rights, financial capital as human fulfillment, competitive nationalism, and individual self-interest as the highest desire and drive of humanity. He predicts and encourages a new political economy which he calls the "Collaborative Commons" to replace the private Market economy. He sees this already occurring in "prosumers" creating and sharing their products at near zero marginal costs. Prosumers are also using and sharing bikes, cars, and homes, enrolling in free online university courses, and even bypassing banks through crowdsourcing and alternate currencies. In the Collaborative Commons social capital (including intellectual, spiritual, and cultural) is more important than financial capital, consumerism gives way to sustainability, and lateral peer-to-peer governance overrides vertical integrated management. Rifkin sees that capitalism and the market economy will be with us for a while but will be diminishing in influence as progressive corporations and government link into and try to profit in the growing Collaborative Commons. Let me describe it by discussing some of my own experiences. My son and his spouse have developed their own enterprise: A Mighty Girl. They have created a website for both social and business purposes. They support themselves frugally in a way they enjoy all the necessities of a good life by promoting girl empowerment. They interact with thousands of parents who help each other in the upbringing of girls to become powerful women. They offer books, clothing, toys, movies, communications, organizations, and services they have reviewed at no extra costs to parents and teachers of girls. They get a small commission from retailers like Amazon, Google, and others to sustain themselves. Recently they spent time in India at the invitation of the government on the occasion of the Year of Women to discuss girl empowerment with parents, teachers, students, and other web entrepreneurs. 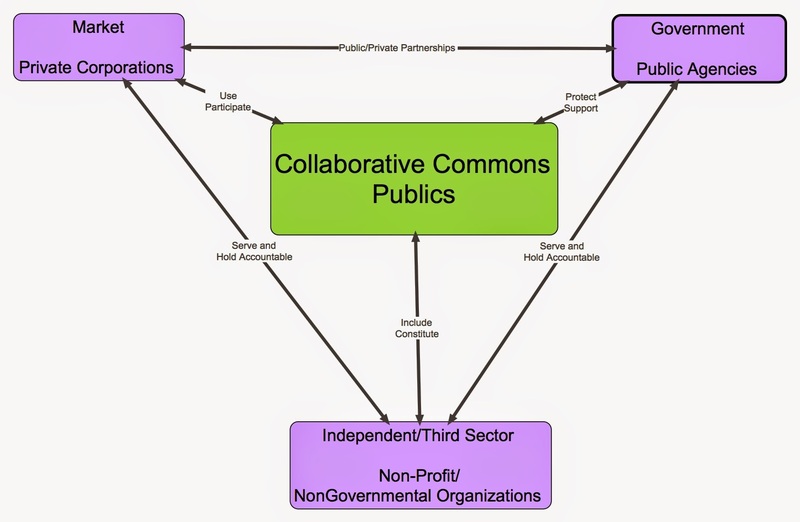 I think this is exactly the type of Collaborative Commons enterprise to which Rifkin is referring. My wife, Bernie, and I just moved into Asbury Methodist Village, a non-profit Continuum of Care Retirement Community, to spend our last 30 years. (I'm 77, she 72.) I compare our arrangement to a reverse mortgage with long-term care insurance. We sold our home and plunked the proceeds down (with some of our savings) as an entrance fee over which, after five years, we will have no claim. We pay a monthly fee that takes up our Social Security and our small pensions payments but will cover our housing with lots of amenities, our meals, and our medical needs forever even if we use up all of our other savings. We own almost nothing; but we want nothing; and I am able to volunteer regularly in pursuit of my vocation. Most important this is an open community in which you see many children and grandchildren, in which people run their own university and classes for continuing education, their own computer centers, sports programs and galas, pastoral care, work with local schools, and really take care of one another. I just wish every aging person had this opportunity and am thankful for Social Security, Tax Deferred Annuities, Pension Plans, and Medicare for our ability to participate and to the diverse Asbury Community starting with the early Methodists who created this sharing community. I worked in many non-profit organizations supported through philanthropy, United Way, churches developing self-help community development organizations and cooperatives in neighborhoods. I once lived in a religious order which shares its work and proceeds so that everyone who continues to commit to the community has all that is needed to live a good life and participate fully in society. Each of these enterprises are hybrids of a sort, using and being used by private corporations and public agencies and assuming many of the non profit and non governmental organizations that serve and are supported by corporations and governments. In the age of Rifkin's Third Industrial Revolution, will the Collaborative Commons grow to assume more of the Market Economy and Government and bring with it the Empathic Civilization that he and many of us envision? But again I remind the reader that my primary purpose is not promoting a certain political, cultural, or economic model of thinking and behaving. I simply want to remind us that our present dogmas, idols, and mythologies are not fixed and sacrosanct. I want to promote thinking and rethinking partially for the delight of it, but mostly because it is our way to preserve and progress. An after note: I just finished reading The Bully Pulpit by Doris Kearns Goodwin. She made it clear that though the greater majority of the population wanted reform and to dethrone the political bosses and their patronage system and subservience to the robber barons, Teddy Roosevelt could do little until people were informed and mobilized through their organizations and associations. Change is not a merely a matter of big donors and huge rallies, but day to day organizing in neighborhoods, churches, workplaces where publics might emerge to preserve and extend the commons. It all started when Cousin Vinnie sent out a post entitled "What is Scarce is Wisdom, not Water" by a conservative author dealing with California Governor Brown's action calling for a 25% reduction of water usage to adapt to the Great Drought. The author is saying that water, a commodity like everything else, should be privatized and should be bought and sold on the open market. But as long as prices are kept artificially low by government action, there is no incentive to move water where demand is high and supply is low. If prices for water (like air, land, sun, DNA, human organs, and humans themselves) are allowed to rise, the profit motive will spur innovation to secure and sell these things to consumers and create competition in which rivals will fight to provide the best service and products at the lowest prices. It is the market that will conserve these commodities and distribute them (fairly?) through efficient pricing. For instance, letting market forces rule would have farmers who own water rights now sell water and make more profit than they would by selling crops. This led me into a wonderful dialogue with a good person (whom I will call Adam) that I think helps clarify the point I am trying to make in my "out of the box" thinking on thinking. At least for my primary intended reader--myself. Adam: The point that the author is making is that govt control maintains water at an artificially low price. Although privatization is a dirty word to Progressives, it simply means free market: when the price rises market forces kick in to take advantage and stabilizes the market by providing solutions and innovations. No government solutions which are generally hidebound and and politically motivated, are as efficient as the laws of supply and demand. Adam, look at your language. "When price rises market forces kick in to take advantage and stabilizes the market etc." This is the language of religious faith. Your mythology is not mine. But let it go at that. I'm not saying you are wrong, I'm just saying this is a very different paradigm. Water is is not a commodity in my mythology. It is not owned by capitalists and should not be subject to market forces. I am not a socialist nor a capitalist; and I really would like to see a truly free market though I think that one does not, and maybe cannot, exist. It is controlled by those who have the most power. However I think we are caught in old concepts based on an old (19th c) mythology in which we make all God's gifts commodities for those who get control of them first. I do look at the end result. Cutting water supplies has economic effects. No matter how we wish it, supply and demand rules persist. I'm reminded of the parable of the servants: the ones who ventured gained; the one who cowered lost. Yes, they do if that’s the way we want to make our world. You make it a law of God. I make it a social construction. No, Rollie, there is no, and has never been any government entity that could control market forces effectively. These forces aren't ordained by God but are the result billions of individual decisions by millions of people, both vendors and consumers that guide the market. They have a life of their own and government's paltry efforts to control them are quite often thwarted by those millions. The basic law of human nature is that individuals tend to make decisions based on what they perceive to be in their best interests. Granted that the decisions they make may not actually be in their best interests but, nonetheless, these decisions make part of the market force. A case in point is the water problem in CA. Probably the best solution is atomic powered desalinization plants but, see foregoing paragraph, the left coast will pass on that option. What you say is a belief. And I respect that belief as I do all religious dogmas. It is a belief in step with a 19th century utilitarian philosophy based on a 19th century doctrine of human nature with supernatural “market forces,” “invisible hands,” “monetization,” “surplus values” and more. It is not my belief or doctrine; but I respect it while at the same time I advocate for the separation of church and state. Religious doctrines may influence politics. I acknowledge that my beliefs (Catholic Social Teaching) certainly influence my politics; but at the same time I recognize that all doctrines need to be revisited, criticized, and revised to better fit the changes in human nature, culture, politics, and economy. belongs to the Industrial Revolution of the 19th and 20th centuries, but not the new industrial revolution we are now experiencing. Both of the American political parties are caught in these old habits of thought. Thankfully, many businesses and corporations, and certain government officials, are recognizing that they might play an important role in the new economy (sometimes called “new capitalism,” “social capitalism,” or “collaborative commons”); and they need to if they are to survive. Neither private nor government control of resources and the means of production is the answer in this new economy in which we seek access to products, but not necessarily ownership of them. So what is the answer? I sure don’t pretend to know. I am just delighted to see so many in the millennial generation experimenting with new ways to think about business, human worth, economics and politics "as if people mattered." Yes, what is scarce is wisdom, not water. I'm not sure why religion has become a part of this conversation on economic theory. Obviously we view the world through two different prisms and the twain shall never meet. Exactly. That is what I am saying. You have your values, faith, and doctrines which are not mine. I admire your persistence, but you are still talking religion and I am talking Economics and Psychology. We are not discussing the same subjects, no matter what our religious bents. No, you miss the point. I’m saying your economics, like most, is a mythology. Yes, including obamanomics and reaganomics. I am just saying all economics (just as Weber taught about capitalism) has a cultural component with unproven assumptions and undefined terms like any formal system (see Gödel’s proof on mathematics). Not all religion is fervorous, but all includes an imaginative narrative for understanding the universe, a paradigm through which even the hardest of sciences depend (see Thomas Kuhn’s great work on the scientific revolution). Einstein himself said that imagination was the chief component of science. I’m not judging the mythology (assumptions, values, symbols, and imaginative framework) which is grounding your economics and giving meaning to its terms. My vocation (which I attribute to Socrates and a few other great teachers) is simply to know that I do not know (i.e. wisdom). That means recognizing that these imaginative frameworks, symbols, images may be useful, but are not absolute and not forever. They need to be continually critiqued and transcended. When you absolutize your doctrines, your concepts, and your models, then you leave the realm of rational interpretation and move to religious fervor. All I am asking you to do is to recognize that a lot of your language (e.g. “market forces,” “supply-demand,” invisible hand”) are metaphors that might or might not work in certain limited times and places—just as I suppose as “spirits,” “angels,” “gods,” “revelations” “ether,” “humors,” "bad vibes,” etc, worked in others. Let's just keep open that with other values and perspectives, there may be other ways of doing economics. Are you sure that you're not a defrocked Jesuit, or perhaps a Nihilist? Your analysis would not allow of any proof of anything. Both social scientists and physical scientists have working hypotheses, some of which seem to work under certain circumstances, but fail under others. Even Einstein's Theory of relativity has its doubters. Reagonomics may have had flaws, but compared to Obamanomics (which was a pale reminder of Roosevelt's New Deal), it was a jewel of great price. Keeping an open mind may be great or it just may be an excuse for failure to commit. So here I stopped to leave the last word to Adam. He begins to move from argument to characterization--i.e. name-calling. And I am reasonably sure that I am not a defrocked Jesuit (whatever that is) or a Nihilist because I accept my contingency and transiency. And I do agree (and thought that is what I was saying about his laissez-faire economics) that scientists use hypotheses which work under certain circumstances and fail under others. And that all proofs (even the theory of relativity) should be critiqued--usually by incorporation into a broader theory as Einstein did with Newtonian physics. As I noted much earlier in these reflections, Descartes' fault was not to doubt everything but to achieve absolute certainty. I continually denied that I was saying his analysis was bad. I just think it is not in tune with changing circumstances and is quite paradigm-limited. I like his statement "keeping an open mind may be great or it just may be an excuse for a failure to commit." But my commitment is to keep an open mind--that is my path to Infinity, Universality, and Integrity.